With 30 plus years in the commercial and residential construction and qualifications in carpentry and quantity surveying, John is your ultimate project manager. 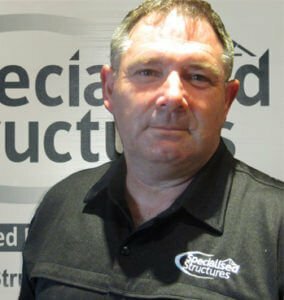 Owner of the very successful D R Borman Ltd, winner of multiple awards in home building, John bought into the Specialised Structures brand name and system to add another dimension to his building portfolio. He sees Specialised Structures adding particular value to his rural clients with the ability to construct large clearspan sheds for animal housing, like the Freestall Cow Barn. John has overseen many light and heavy commercial builds. He’s also an expert in million dollar residential builds. His strong attention to detail, combined with skills in quantity surveying and years of experience in project management are just some of the reasons we enjoy having him on our team. He also has a strong community focus with a place on the Chanel College Board of Trustees and Masterton Rotary. And he’s a keen squash player with membership in the Red Star Squash Club and Wairarapa Squash Collective. John is a member of the New Zealand Master Builders Association and The Building Hub. Providing customised steel building solutions to the following areas within the Wairarapa region; Masterton, Carterton, Greytown, Martinborough, Featherston, Eketahuna and the wider area.